The Princess is a family car that was produced in the United Kingdom by British Leyland from 1975 until 1981. The car inherited a front-wheel drive / transverse engine configuration from its predecessor, the BMC ADO17 range. This was still unusual in Europe for full-sized family cars and gave the Princess a cabin space advantage when compared with similarly sized cars from competing manufacturers. The car, which was given the design code ADO71, was originally marketed as the Austin / Morris / Wolseley 18–22 series. In 1975 the range was renamed “Princess”. This was a new marque created by British Leyland although it had previously been used as a model name on the Austin Princess limousine from 1947 to 1956. The Princess is often referred to as the Austin Princess, but this name was not used in the home (UK) market. It was, however, used in New Zealand. 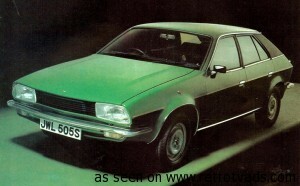 The car later appeared in revamped form as the Austin Ambassador, which was produced from 1982 until 1984 and only ever sold in Britain.